Republicans Said China Wouldn’t Follow Through on its Climate Pledges. Looks Like They Were Wrong. The world’s top emitter is pledging to cap coal use starting in 2020. Indeed, exactly how China will begin to “peak” its emissions around 2030 without a legally binding agreement is still an open question. Historically, there’s been widespread suspicion about China’s intentions on the issue—the country has, after all, been a thorn in the side of international climate negotiations for years. And even the White House appeared to raise an eyebrow at the staggering scale of the cleaner energy sources China would need to install to reach its goals: the non-fossil fuel equivalent of the “total current electricity generation capacity in the United States” over the next 16 years, the White House said. But this week, China’s leadership has begun to answer that question. According to reports in state-controlled media, China’s State Council—essentially its cabinet—unveiled a new cap on annual coal use Wednesday. Under the new targets, China will limit coal consumption to 4.2 billion tons in 2020. That’s an increase from 3.75 billion tons last year. But relative to the country’s overall energy consumption mix, it’s a reduction; last year, coal accounted for around 67 percent of China’s energy consumption. Under the new plan, that figure would fall to 62 percent in 2020. The Xinhua report also says that the share of non-fossil fuels will rise to 15 percent by 2020 (from 9.8 percent in 2013)—a significant advance towards the goal of reaching 20 percent by 2030 outlined in the US-China deal. While the cap represents a big step politically—coming from the State Council—the new promises are consistent with current trends in China. Many provinces have recently introduced air quality policies that seek to reverse the rapid growth in coal use, according to a Greenpeace report released in April. 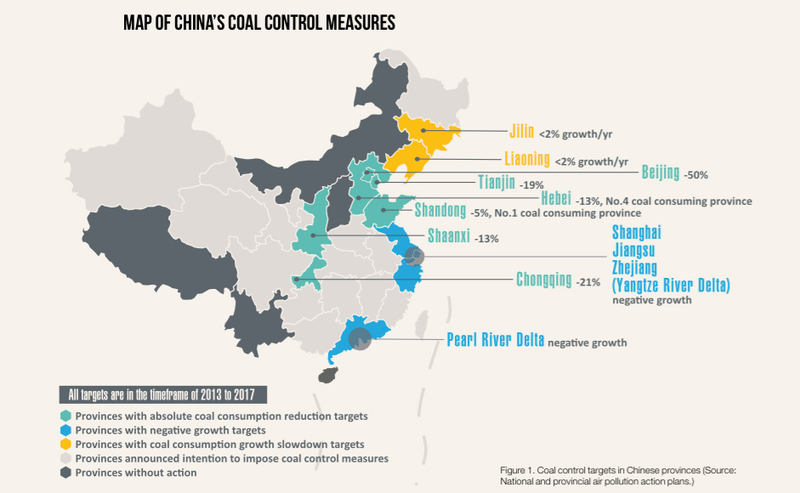 Twelve of China’s 34 provinces, accounting for 44 percent of the country’s coal consumption, have already pledged to implement coal control measures, according to the report. Twelve Chinese provinces have already pledged to implement coal control measures. Click to view a larger version. This week’s announcement is likely to cement China’s plans at the very highest levels of government—and it sends a signal to the international community that the country means business. The South China Morning Postreports that the new targets announced this week are likely to make their way into China’s official “five year plan”—a kind of economic development master plan that will be formalized next year and will dictate top-down strategy for 2016-2020.